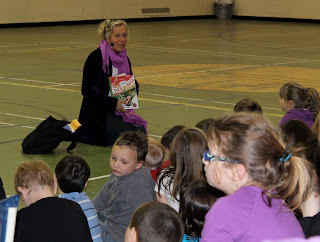 Award-winning children's author Sheree Fitch was at Blackville School on Tuesday, November 27. Fitch shared her stories and poems with the elementary students. This weeks Student of the week is Robyn Stewart from Mrs. Manderville's grade 5 class. Robyn has been picked for being a very friendly girl with a great sense of humor. Robyn is a wonderful classroom helper and works very hard each day in class. Congratulations Robyn from everyone at BHS! 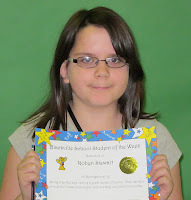 A student from grade four or five is selected Student of the Week on a bi-weekly basis. 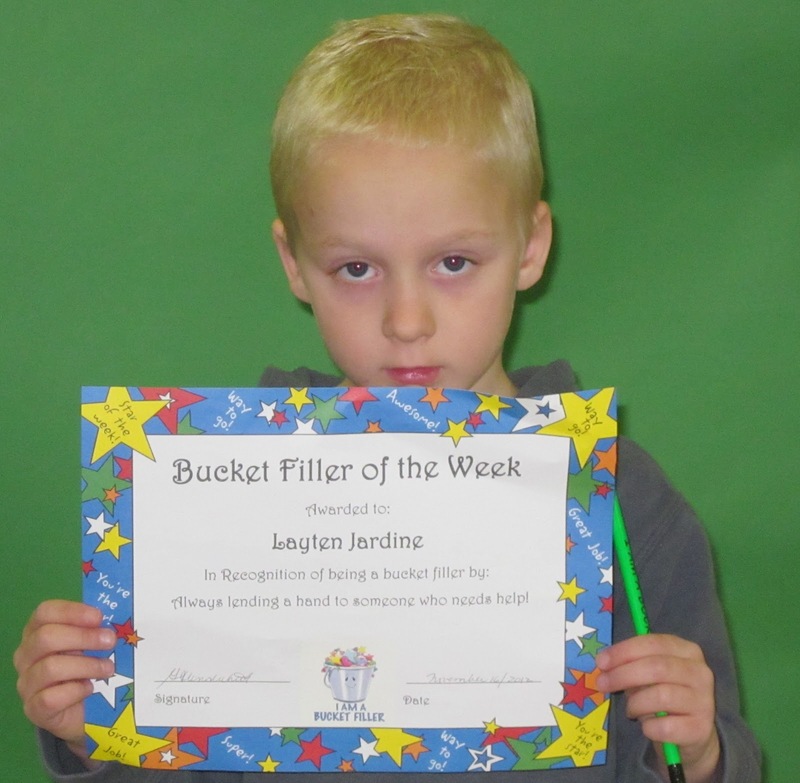 Layten Jardine from grade 1N was the Bucket Filler of the Week. Layten is always willing to help out others. 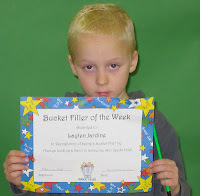 Congratulations to Layten for doing such a good job at filling someone else's bucket. A student from kindergarten to grade three is recognized as Bucket Filler of the Week on a bi-weekly basis. Students and staff at Blackville School raised $1300.00 for the fight against cancer. The school had an assembly on Monday morning, November 19 to celebrate the amount raised and watch three school members get their hair cut. Middle school teacher Madame Michelle Tobin-Forgrave, grade 12 Student Council President Marissa Donohue, and grade 7 student Abby Donovan all donated some of their hair. Their donation will be used to make wigs for patients who lose their hair as the result of cancer treatment. Local hairdresser Lori Anne Jardine was on hand to help with the hair cuts. Cassidy Hallihan of grade 4D was the Student of the Week for the week of November 5 - 9. 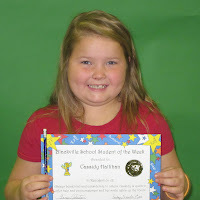 Cassidy is always kind and considerate to others, and she is quick to offer encouragement and help. Her smile lights up the room, and she begins each day with a positive attitude. She sets a fine example for her peers. Congratulations from everyone at Blackville School, Cassidy! 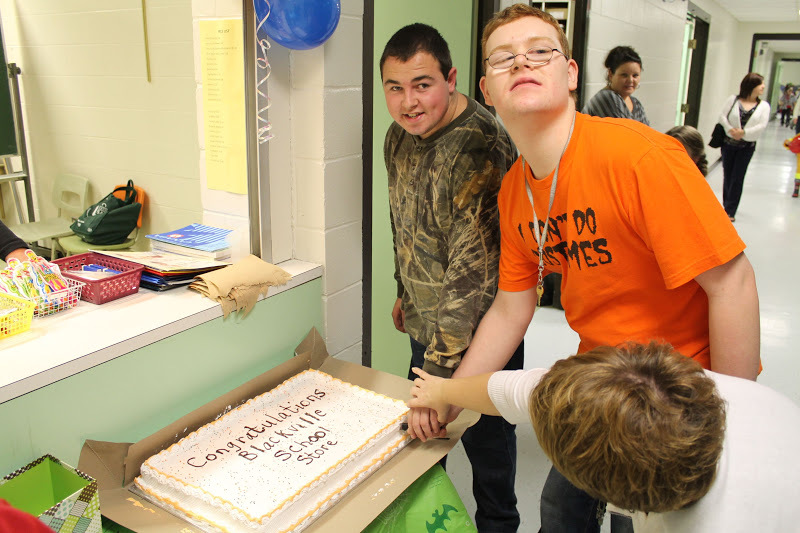 The Blackville School Store recently held their grand opening to celebrate their new location by the cafeteria. Students Dustin Conners and Alex Fiander cut the cake at lunch time on October 31. Both students help run the store which is open on Tuesday and Wednesday from 11:30-12:00 and 1:25-1:45. The store has a number of school items in stock along with extra products such as rings, water bottle holders and sidewalk chalk. 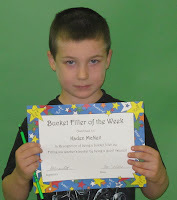 Kaden McNeil from grade 1M was the Bucket Filler of the Week. Kaden is a good listener even when others around him are not listening. Congratulations to Kaden for doing such a good job at filling someone else's bucket. 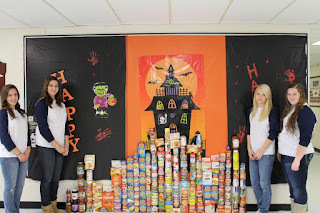 While many children were knocking on doors asking for candy on October 31, members of the Blackville High School Student Council were going door to door asking for donations for the local food bank. The four students collected six milk crates full of non-perishable food items that will be donated to the Blackville Food Bank. Staff or students who would like to add to the contribution can still bring in their items until Friday, November 2. The four council members were (left to right) Whitney Tucker, Cassandra Waugh, Valeja Birnbach, and Marissa Donohue.